Most of the excellent rock climbing in South Dakota is located in the Black Hills region. There are many routes of all difficulties at Devils Tower, Custer State Park and the Mount Rushmore area. Scaling the mountains, peaks and rocky cliffs is both challenging and rewarding. Black Hills Climbing provides safety and adventure for the entire family, with an experienced crew your family can have an exciting time at multiple locations. 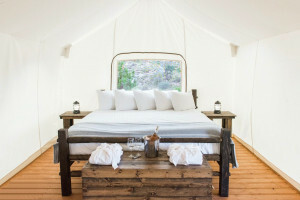 A B&B and climbing retreat located right next door to Devils Tower National Monument. Offering a range of classes and packages for all levels. This store sells gear for climbers, hikers, and campers. They also sell clothing and footwear. 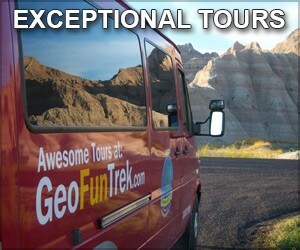 Come tour the crystal-studded subterranean caverns of Sitting Bull Crystal Caverns with our friendly guides. Step it up a notch on a spelunking tour. Spend an exhilarating day rock climbing in the Black Hills. No experience is necessary and all equipment is provided. Ascend limestone walls, granite “spears” and rocky faces when you rock climb in the Black Hills. Find your ideal rock in Custer State Park, Devils Tower, Spearfish Canyon or the Mount Rushmore area. Enjoy a summer day of Black Hills rock climbing, with several types of rock face, levels of difficulty and locations to choose from, all featured within breathtaking landscapes. 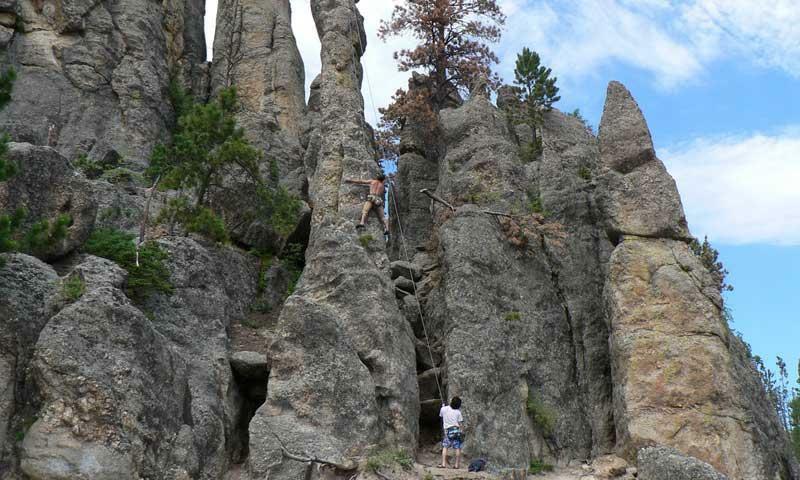 Custer State Park: A popular climbing location, Custer State Park is also known as the “Needles of South Dakota,” due to the granite spears shooting up towards the sky. Here you will find climbing areas catering to all abilities; a perfect place to summit your very first rock face. Featuring the Cathedral Spires, Needles Eye, and Ten Pins. Several routes for novice and experienced climbers. 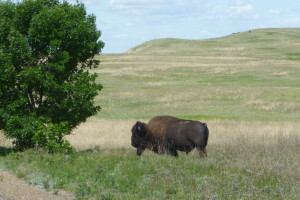 Rest once you summit and spot bison, elk, and deer as you survey the landscape. Mount Rushmore Area: Take a photo of past Presidents and then head into the surrounding area – over 1200 acres – with plentiful climbing locations to pass the day. Several climbing areas feature modern protections. Easy access to a variety of locations. Absolutely no climbing on Mount Rushmore itself (you will promptly be arrested). Devils Tower: A “crack climbers” dream spot, Devils Tower, located in northwest Wyoming, provides continuous cracks along its volcanic colonnade to entertain climbers for days. Summit this extraordinary geological formation as an experienced climber or novice with guided instruction. Take in views of Wyoming’s plains from the summit. Spearfish Canyon: A relatively new Black Hills climbing area, test your cragging abilities on the limestone canyon walls. Featuring Sunshine Wall, which offers a great place to climb in the sun during winter months. Take the trepidation out of trying this exciting outdoor activity and utilize one of the local guide services, providing instruction for families, large groups, and experienced and inexperienced solo climbers. A wonderful source of information on personal accounts of climbs and assents.